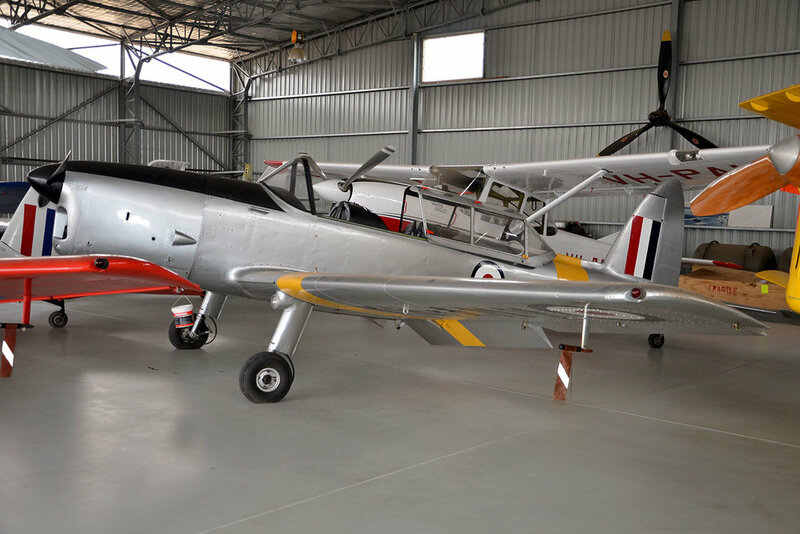 The Chipmunk was acquired in 2005 as a trainer for tail wheel instruction and for Joy Flights. It is a Warbird in its own right having served with the RAF and is a highly regarded training aircraft with over 1200 being produced in Canada, the UK and Portugal. The DHC1 Chipmunk was designed just after World War II with the intention for it to replace the Tiger Moth as a trainer, and was first flown in 1946. Originally designed and built in Canada it went on to be built in both Britain and Portugal, with a total of 1298 being assembled in the three countries. 735 of these aircraft were used at the RAF’s primary pilot training bases, these were upgraded to the Gipsy Major 8 engine and designed as T 10's. The Chipmunk was not fully withdrawn from service until 1996. . This aircraft was built in 1950 as a Chipmunk T.10. for the RAF as an initial trainer aircraft and served from 28 August 1950 to 24 August 1956 with various UK based training squadrons serialed as WB722. In 1956 the aircraft was made surplus to requirements and was sold to Derby Aviation, Burnaston Airport, Derby, UK and civil registered as G-AOSP. In 1958 the aircraft was again sold on to an unknown Australian buyer and was shipped to Australia and registered as VH-BTL. However, it almost immediately moved on to a new owner in the Royal Aero Club of South Australia re registered as VH-BWF. The Aero club sold the aircraft in 1963 to Bob Couper Pty Ltd at Cunderdin WA now registered as VH-AMV. The aircraft was purchased by Pay’s Air Service on 20th June 2005 and is still registered as VH-AMV.